Here’s a dramatic scene out of WWII. 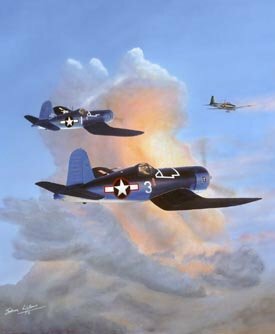 A pair of F4U Corsairs are pursuing a Japanese Zero with golden sunlight giving the clouds a brilliant glow. The careful observer will know the time frame is around 1943 because of the Corsair markings. The plane in the foreground has red markings. Those were changed to blue that year to avoid confusion with red markings on enemy aircraft. You can see the plane in the background has been switched to blue markings. Jim Streig is the pilot in the number 3 plane, and Tommy Blackburn sits in the cockpit of number 1. Both men were members of the Jolly Rogers, Fighting Squadron 17. The image size is 18.5" x 15.5" and prints are available in a Limited Edition of 250 Signed and Numbered and 25 Artist Proofs.